The business decision making course will develop an understanding of how to carry out a business analysis. It reviews business models grounded in economics but also introduces an accounting framework for the process. This value added accounting framework uses publicly available information to interpret business performance. Students are usually expected to produce a conclusive business strategy assignment for making the formative assessment component of this course. The final project will use both primary and secondary forms of data as well as provide information where and how these can be obtained. The difference between quantitative and qualitative forms of decision data should also be included. The decision making assignment must effectively define the process used for coming to a conclusion. This is usually a 7 step process with the following constituents. Problem definition: Clearly define the nature of the problem as well as all of its repercussions. Gathering information: Some information will be directly related to the problem while secondary events may be the consequences of the problem. All forms of primary and secondary information pertinent to the problem should be accumulated. List potential alternatives: While collecting information you may come across alternative plans of actions which could be implemented, alternatives. Try to come up with or accrue as many possible alternatives which can be implemented as solutions. Evaluating alternatives: All possible solutions must be analysed for practicality according to the risk involved, budget, time and available resources. Selecting the best alternative: With all the pertinent information at hand, all that is left to do is determine the best solution. It may be a combination of alternatives or a single solution. Implementation of the decision: The final resolution must be effectively communicated, accepted by subordinates and executed with proper timing. Monitoring and feedback: The outcome and results of your business judgement need to be evaluated for productivity. It may be possible that some steps will need to be repeated with new information to reach a more practical or productive solution. 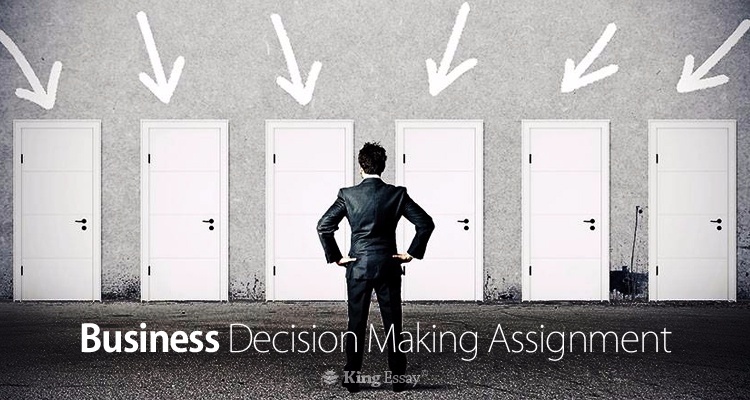 The final business assignment provided by King Essay will employ all the relevant business techniques related to each step. King Essay believes in providing quality assistance. The above is just a basic guideline of the process involved in making a productive decision related to the business. When you buy assignment online from us, you will have the privilege of availing several guarantees as a standard. The final assignment will be delivered with a money-back guarantee to your deadline with zero plagiarism in the contents. We will supply the complimentary composition of a title page and a references section making the contents completely free of plagiarism. Business students can also avail seasonal and promotional discounts throughout the course of the year. Customer support will be available 24/7 since it is our strong belief that the customer is our greatest asset.